Come and be one of the first to ride our flume! After a five year wait we can confirm that the flume at Splash is back in action. Come and be one of the first to ride the flume! The much-loved bright orange and blue flume, standing 5.29m high and offering a 40m water ride, has been out of action due to corroded steps for over five years but was a priority for us upon commencing the management of the contract, so we invested over £30,000 into reinstating it and we think this is money well spent! In total we have invested £470,000 for improvements across the three leisure and entertainment sites (Pemeberton, Nene & Splash) to date in a bid to support East Northamptonshire Council provide its residents with great leisure and fitness facilities. 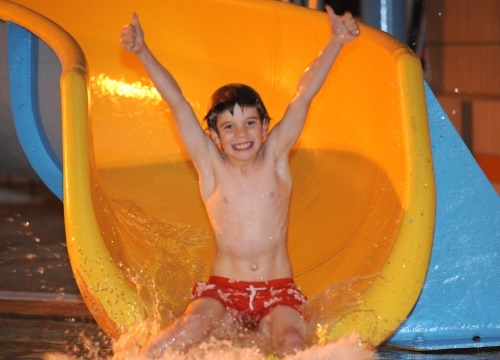 We cannot wait to welcome residents of East Northamptonshire to ride the flume at Splash once more. We really hope you enjoy your visit. Wed 18 October Splash Gym!